We pick the seven best AE86 Corolla drift builds to celebrate nearly three decades of the mighty Hachiroku on the drifting scene. The Toyota AE86 Corolla is one of the drifting communities most loved and cherished platforms, the little car’s popularity no doubt being boosted by the on screen drifting exploits of Takumi in the Japanese Anime – ‘Initial D’ (those exploits inspired in turn by the Drift King – Keiichi Tsuchiya himself). There will always be diehard enthusiasts that won’t let these obstacles stop them flying the AE86 drifting flag and we salute those champions. As time marches on the AE86 is becoming an old platform, mechanical components need increasing amounts of work, parts are becoming scarcer and clean examples are becoming rarer so to see an AE86 drifting in 2016 and beyond is unfortunately not likely. Of course there will always be diehard enthusiasts that won’t let these obstacles stop them flying the AE86 drifting flag and we salute those champions. To celebrate the mighty AE86’s illustrious drifting career I have picked seven awesome examples from Drifted’s own car feature archives. You can read my comments on each of the AE86’s below and click on the links to view more photos and read that car’s full feature. Viva la 86! Hailing from the Emerald Isle, Adrian’s booted Hachi kicks things off with a scream! Sporting loud yellow paint, a full aero kit, bolted on wide arches, dished Wantanabes and a turbocharged surprise under the hood. This is a perfect example of how to build a great AE86. 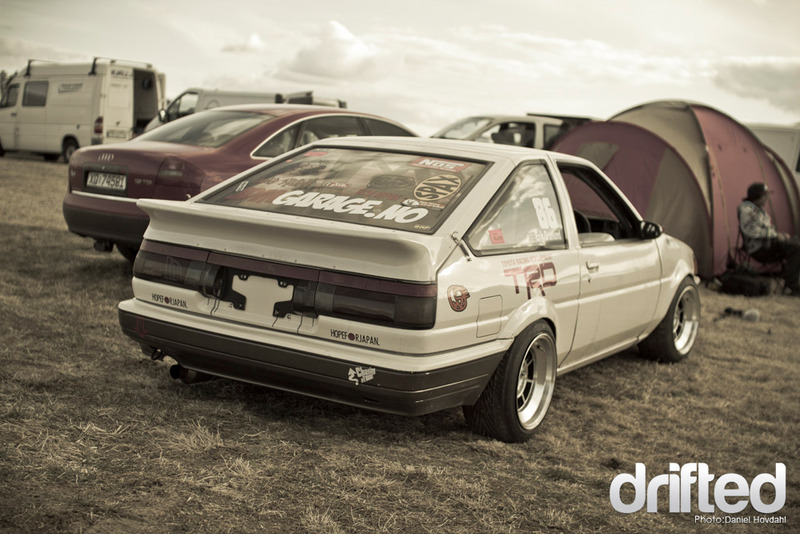 Read the full AE86 feature here. Our next AE86 is a home grown UK built street car. Sporting gleaming black paintwork, Monkey Magic aero, wide arches, a purposeful stance and a fully rebuilt SR20det this Trueno GT APEX is certainly worth a closer look. Read the full SR86 article here. Allow me to take you over the Atlantic to a past Formula Drift competition car; Will Parson’s AE86 Corolla. Being a competition car at the highest drifting level means that Will’s humble Hachi required an extensive makeover and ultimately became a full on race car. Toyota’s classic sports coupe has been fully stripped, caged, track prepared and packs a potent F20 powered drivetrain under the hood. This top level competition car from yesteryear shows just how far you can push the Hachiroku platform to be competitive in motorsport. 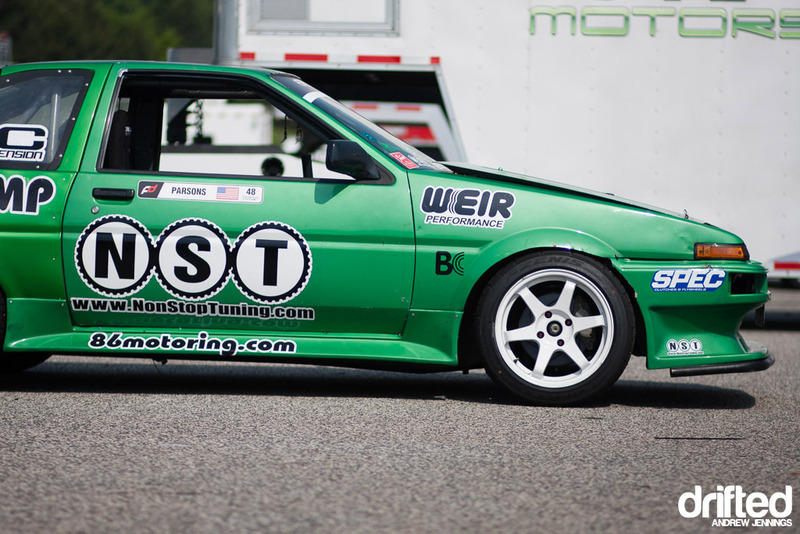 You can see more photos of Will Parson’s AE86 track warrior right here. Hit play on the video above to see a great round-up of Will’s 2012 Formula Drift season in his AE86 drift car. 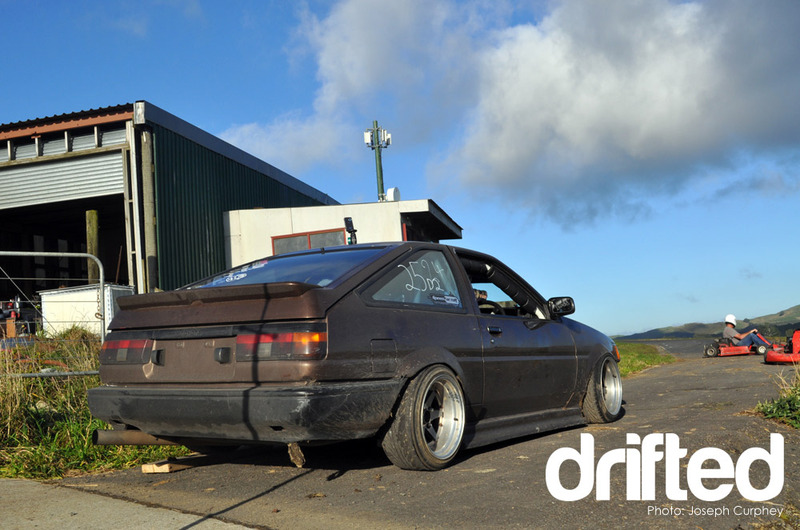 Ashleigh Monaghan takes us over to New Zealand to find our next Hachi drift car build, this immaculate 1985 model year Levin has been owned by a dedicated 86 enthusiast who has had the car for nearly a decade at the time of this feature. The car is in incredible condition and has been blessed with subtle exterior touches, period correct wheels and a 20v Blacktop AE111 Corolla engine fitted with quad throttle bodies! See the full feature of Paul’s Levin here. Hit play on the video above to hear what a 20v Blacktop on throttle bodies sounds like..
We head back over to Europe for a slightly more extreme AE86 drift car build! Erik Granlund’s JDM inspired AE86 drift car is no show queen. Minor imperfections, a fully stripped interior and a tuned 4A-GE twin cam on Webber carbs completes the package. Erik later dropped a Honda F20c into the car, you can see a video of that below. 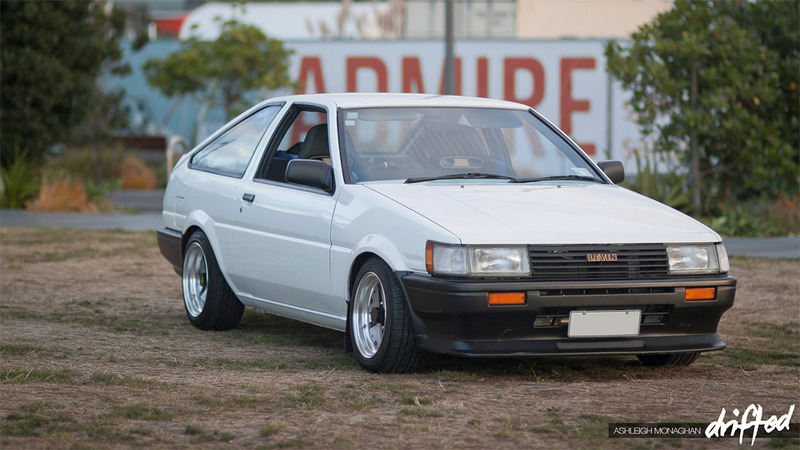 See more of this JDM AE86 right here. 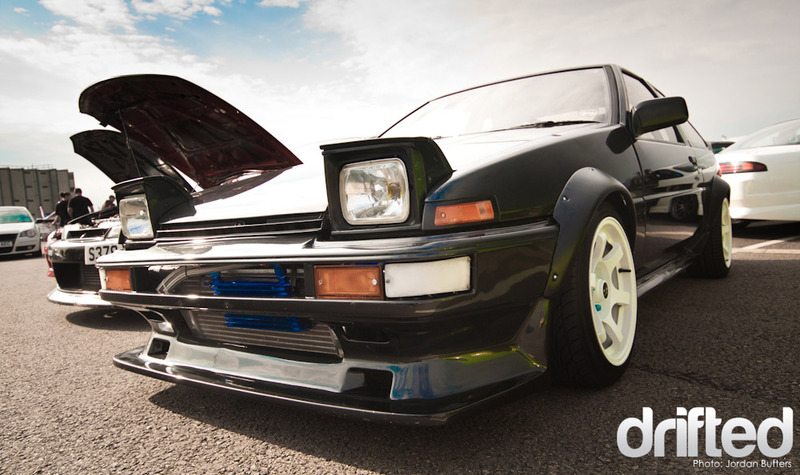 Joseph Curphey shot Hugo’s F20c powered Toyota AE85 back in 2010 at a private Go-Kart circuit. I think the brown paint, the aggressive stance and Honda’s high revving VTEC engine make this one of my favourite Hachi drift car builds. Read the full feature here. For our final featured AE86 drift car build we head up North to Canada. Cole Chalmers shot this beautiful panda example while out on a night time Tofu run with it’s owner back in 2011. The car’s clean paintwork, select choice of aero additions and belly scraping stance make for a stunning looking car. I would love to see this on the road! Nestled under the hood is a lightly tuned 4A-GE twin cam engine. 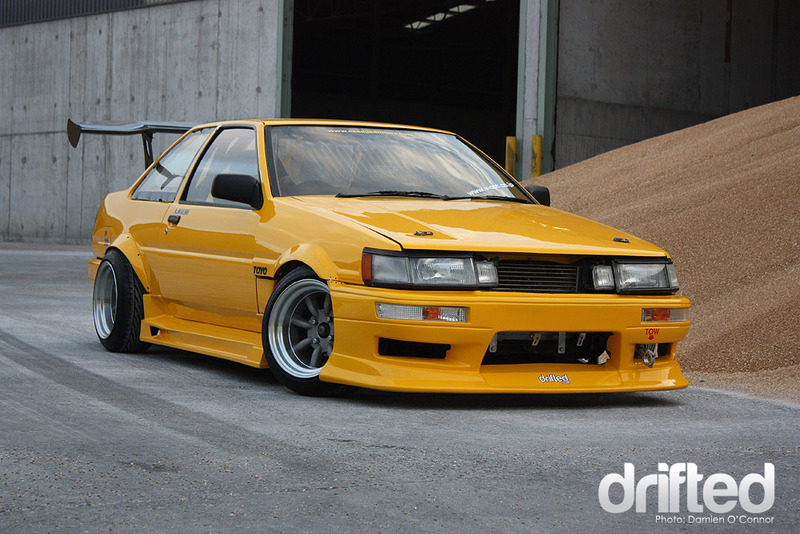 See more pictures of this beautiful AE86 here. 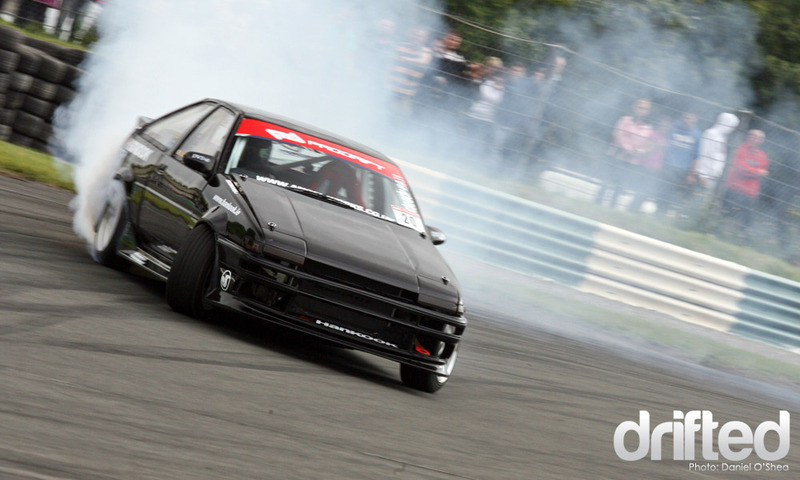 Which AE86 drift car build is my favourite? So those were my seven favourite AE86 drift car builds of the past few years, but what if I was lucky enough to drive one of these amazing cars home – which would it be? For me it would be the black SR86. The car has killer looks, a powerful and reliable drivetrain and that classic Trueno popup style – what’s not to love? That’s my opinion, which is your favourite? Let me know in the comments below. Thanks for reading. If you are looking for a racing helmet to go with you own AE86 then check out this website for some solid reviews. Remember to subscribe to Drifted to be in for a chance to win a Drifted lanyard absolutely free. « Ripping up the touge!